archy: Mystery animal baffles scientists!! Not really. The Daily Telegraph says,"A creature dubbed the 'oriental yeti' is being examined by scientists after emerging from ancient woodlands in remote central China." 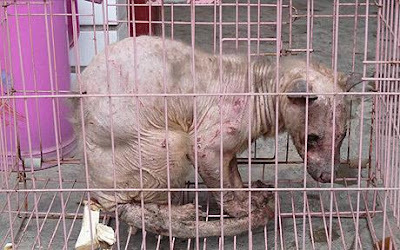 This sort of mystery animal pops up all the time and all over the world. They are always some familiar (or at least known) animal in an unfamiliar condition. Sometimes they are found washed up on a beach after having been the water long enough to lose their hair and get bloated but, for some reason, not yeat eaten by scavengers. Other times, they are suffereing from mange or some other skin disease, like this miserable looking fellow. 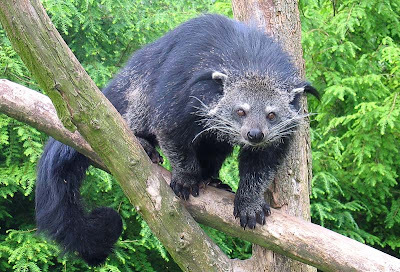 I'm calling dibs on it being a Binturong. Any other bets? Mystery animal. A Binturong with mange?